The White Stripes have released limited edition camera sets on their website. The whole set is themed in their red, black and white signature colors. 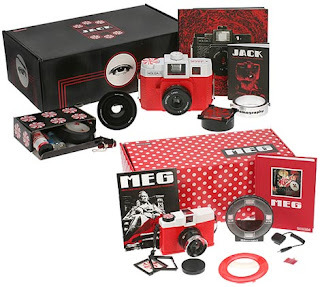 The band offers two different kits for sale, The JACK Holga Flash Camera Starter Kit and the MEG Diana+ Multi function all-plastic camera. They each sell for US$180 and although only 3000 of those were made, they are still for sale on their website. A lot of artists use this limited edition model but sometimes it doesn't always do its job. However Nine Inch Nails used this same model with their limited edition deluxe box and it sold out in weeks. The camera sets are a great way to enforce the band's brand. They are very unique in many ways but loads of bands get lost in the crowd after a few years and by creating unique branded products they can have a stronger impact on their fans while also creating a culture around their image. Smart move by their managers and label - or maybe it was their idea?